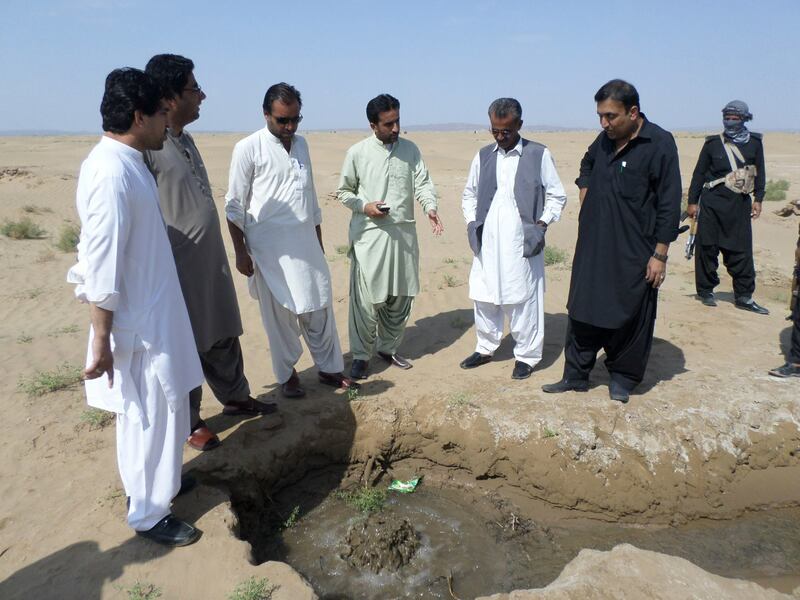 Chagai – Chairman District Council Chagai, Mir Dawood Khan Notezai, took notice Of several leakages in main pipe line of drinking water supply scheme in Siyah Jungle, some 5 kilometers away from Dalbandin. Balochistan Point had reported yesterday about the leakage issue. On Saturday, District Chairman accompanied by Assistant Commissioner Dalbandin Razzaq Sasoli, Public Health Engineering SDO Sanaullah Baloch and local journalists, visited the area. Mr. Notezai expressed displeasure on wastage of drinking water in deserted area where it created hunting points for local hunters. He questioned the concern officials about maintenance fund and asked them to fix the leakages as soon as possible. He appreciated journalists of Dalbandin for exploring and highlighting such public interest issues which can help in solving problems. He directed the PHE officials to make a comprehensive estimate of needs of department for overcoming the lack of water permanently so he could include the estimated amount for next budget. District Chairman has given deadline on one week to PHE officials for covering all the leakages of main water supply. Any further negligence by PHE will not be tolerated, he concluded.